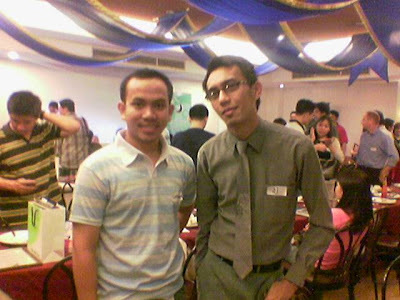 Last year ay kasama ako sa August 1, 2007 Eyeball: Top 10 Emerging Influential Blogs 2007 Winners Announcement and here are the pics (August 1 Blogger Eyeball : One of My Most Memorable Adventure!) that are so memorable talaga kasi that's my first time makasama sa gathering ng mga bloggers. I met there Cliff, Penny, AJ and some others. Sa kanila lang kasi ako nakapagtry magpapicture kasi late nga ako tapos medyo nahihiya pa ako sa crowd. Hehe! Raffle Draw - 10 winners (from the entries master list) who will get US$100 each. Of course, those who can't make it are still part of the draw and can win. Recognition - The Top 10 Emerging Influential Blogs 2008 - as chosen by writing project participants. Well, sa mga pupunta, I hope to see you there! Good thing you have pictures all over your blog, 'coz I wouldn't be able to recognize you if ever. See you. I hope to see you all guys... Hehe :) SHy po ako at sana may maging friend naman ako 'dun at makatulong sa akin pagbablog. Hehe! See you rin Jez, Blogista, Ed at Poytee! בית מלון [url=http://www.kfarbair.com]כפר בעיר[/url] - שלווה, [url=http://www.kfarbair.com/about.html]חדרים[/url] מרווחים, אינטימיות, [url=http://kfarbair.com/services.html]שקט[/url] . אנחנו מציעים שירותי אירוח מיוחדים גם ישנו במקום שירות חדרים המכיל [url=http://www.kfarbair.com/eng/index.html]סעודות רומנטיות[/url] במחירים מיוחדים אשר יוגשו ישירות לחדרכם. The net has changed our world drastically over the past twenty years . Not simply has the cyberspace spread the world by countenancing inst communication, but it has opened up the world by levelling the playing field for commerce. A individual no more has to have a stock movement or a commercial government agency to take part in the world of commerce. The internet has allowed for many citizenries to build an net home based business. Constructing an internet home based business has got a popular agency to run a home based business. The advantages of running a business online include having a big market place, many peoples that inflict that market place and a very lower overhead cost . Another vantage of running an internet home based business is the illusion of having a big business. The cyberspace can make is a false signified of reality. One someone can course what seems like a large business, but is actually an internet home based business.